This web site provides transcriptions of letters written by Austin Dewitt Boyd during 1917 and 1918 during his service in the United States Army in World War I. These letters were written to his parents and teach us a bit about the man and the army, the war, and the country in which he served. 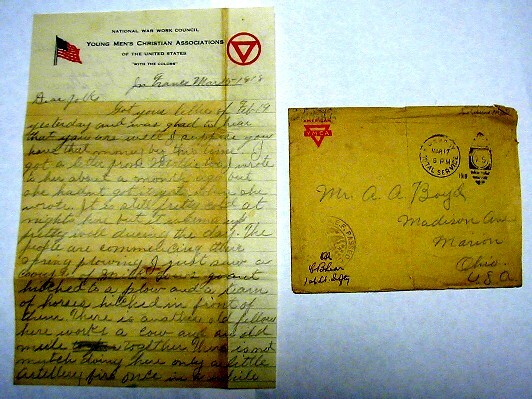 Below is a photo of his letter from March 15, 1918. I've used some image enhancement to make it a little more readable as a computer image. The writing isn't actually as clear as it appears here. You can see the notation on the lower left hand corner of the envelope which was done by a censor. The back of the letter has a similar notation. You can see the transcription of this letter here. I have attempted to make the transcription as close to his original writing as possible. There were some places where the actual writing wasn't completely clear, but these instances only affected the spelling and grammar, not the meaning of what was being written. Background information is provided in highlighted paragraphs. This information is taken nearly verbatim from "Ohio In The Rainbow : official story of the 166th infantry, 42nd division, in the World War" by . Raymond Minshall Cheseldine. This photo was in my Grandfather's effects. There are no markings on it to indicate who the men are or when it was taken. It looks to be a company of men, so I can only assume that it is Company D, of the 166th Inf., 42d, the unit my Grandfather served in. I am guessing that he is in the fifth row back, third from the right.. 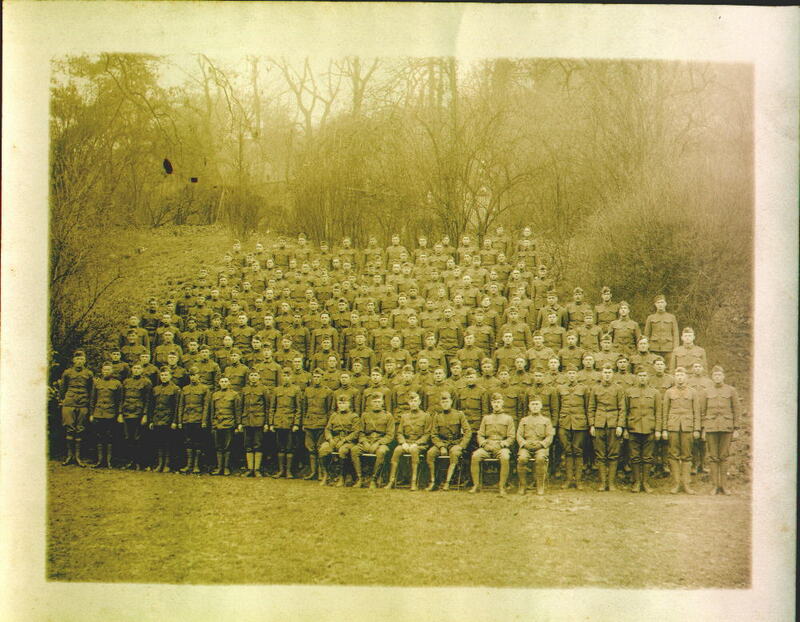 I believe this is Co. D, 166th Inf., probably in France, 1917. Click the photo to open a larger, higher resolution version. If you can identify someone, please let me know! Sgt. R. Bailey - 5th row, second from left end. Note: All of these identifications are simply by visual recognition. We do not have key for the photograph, nor do we know exactly when the photo was taken. On November 9th, 2006, I received an e-mail from Doug Dooling who's grandfather served in this same unit. See this link to an article published in Stars & Stripes (PDF format) for the story about his grandfather. He was Pvt. 1st Class Steven Smith, who the Co. D records in "Ohio In The Rainbow" show that he was transfered out of Co. D on Nov. 16, 1918. There was also in my grandfather's affects, a photo of a group of German soldiers, again unmarked (can be seen on the Information page). I can only assume that my grandfather was given this other photo some time after completing his service, probably at a reunion. It was with the a photo from the 1938 reunion. If you have any ideas on either photo, please contact me.